Fuzzy Soakers Crazy Fur - Red, White & Blue. 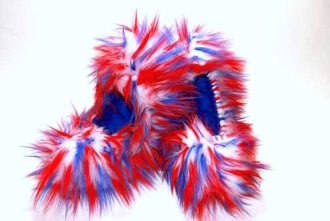 This pair of Fuzzy Soakers® is constructed using wild long hair red, white and blue crazy faux fur fabric. A great way to show your American Spirit & Patriotism! One size fits up to 12 1/2" blade (blade measurement toe pick to tail)..